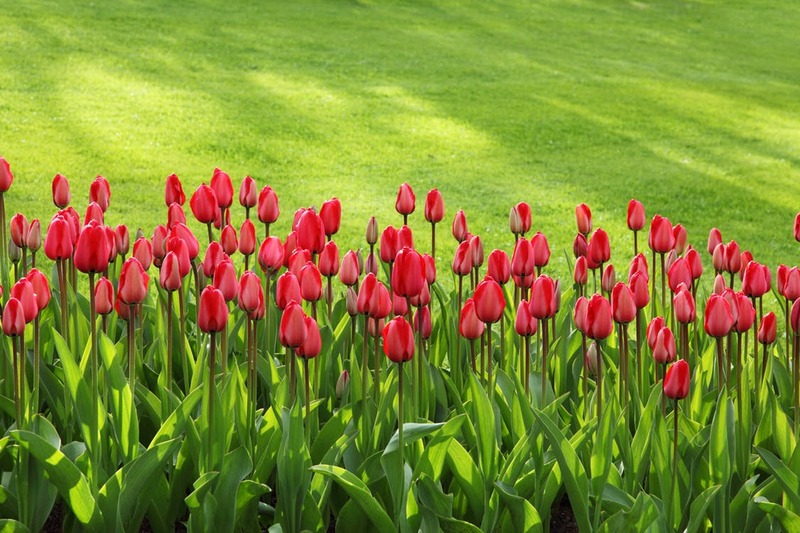 The best plants to compliment a beautiful lawn aren’t always the huge bushes that crowd your neat borders & sprinkle dead petals over your freshly-mown turf. As you’ve probably realised if you’ve ever tentatively hammered your mower into an encroaching geranium and realised that this lawn isn’t big enough for the two of them, plants need their space-grass included. Light is at a premium in most residential gardens, as is drainage- piling more and more bushy giants around your border is just going to lead to the bulky plants in question spilling onto your lawn- leaving your edges untidy, hard-to-manage and deprived of the light and evaporation they need to flourish. Larger plants are, of course, great additions to your garden, but you may need to assign them to areas away from the edge of the lawn, and plan to accommodate their growth over time when measuring the dimensions of your lawn. Large plants don’t have to be on your borders to cause problems- while planning you garden layout, consider the direction and dispersal of sunlight over your lawn. Large plants that might block the sun at key times of day should be positioned so your lawn can get as much light as possible. While you may never be able to offer your lawn completely unbroken natural light, do everything you can to ensure each part of your garden gets several hours of light per day. This is especially important for your lawn- where uneven sunlight can cause uneven water retention- leading to bald, muddy patches in under-lit areas. If your garden is used for chilled summer barbecues, relaxing and reading, your choice of borders should reflect this. These sedate activities favour more fragile, but colourful plants that create a pleasant ambience and great atmosphere perfect for unwinding. If your lawn is more likely to be used for football, kids’ games and as a playground for large pets, you may prefer something hardier- as it may have to cope with being knocked by these activities. Lawns are, to a large extent, a question of space management. They have the potential to create the illusion of more space, but if overshadowed by an out-of-hand bush or tree they can seem even smaller. You may have always wanted an apple tree in your garden, but a manageable 4-footer can quickly turn into a big nuisance. Remember to research and plan your garden development projects carefully and always take into account the amount by which plants, shrubs and trees grow- or you (and uour lawn) may come to regret your decision!